From the moment I entered the foyer of the National Theatre one evening last month, I could tell something was new. The atmosphere felt different. There was something in the air: anticipation. Was it a new crowd? A different crowd? Then I sat down in the Olivier to watch Chris Bush’s new adaptation of Pericles and everything became clear. 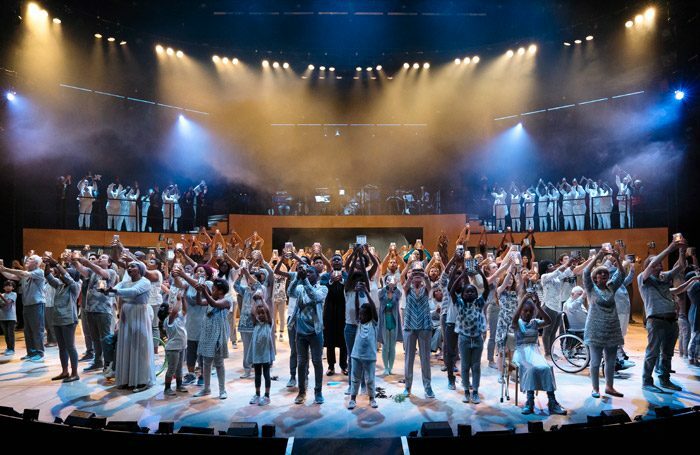 The National Theatre has just performed an extraordinary and radical act of inclusivity. Pericles marks the mid-point in a two-year project called Public Acts, inspired by the Public Theater in New York’s Public Works. This initiative is designed to encourage the participation of – yes, you’ve guessed it – the public. During the performance, we witnessed the coming together of communities from in and around the capital including a Bulgarian choir, a gospel choir, a gymnastics troupe, a hip-hop and funk dance team, Indian drummers and more. This was a deep communion: a generous sharing of talents, cultures, languages and spirits. Under the direction of Emily Lim, the production wittily surprised us time and again – with ska-singing pirates, a Michael Jackson tribute and a maritime drag queen – until the sense of pride from the performers washed over the footlights like a tidal wave. It was one of those rare occasions when all barriers between audience and actors were banished, and we collectively felt a deep sense of pride in the tolerant, welcoming, generous landscape of the arts. Projects such as Public Acts – and indeed, its cousins Sheffield People’s Theatre and many other community groups up and down the country – are significant for many reasons, but one reason stands above the others. They offer opportunities for members of our communities to engage with our artistic institutions in a new way. At their best, they invite deeper levels of participation and offer empowering platforms to those who might not have even set foot inside the buildings before – or even thought of doing so. In that sense, they are a democratising force. In a world in which arts education is suffering pitifully due to the lack of value placed on it by our government, the responsibility falls more heavily on our arts institutions to provide accessible and affordable experiences that offer all kinds of people opportunities to engage in the arts in practical, meaningful and creative ways. Pericles embodies this offer. As the finale of the production swelled to a peak, the curtains in Fly Davis’ beautiful design opened and the entire cast was revealed before they drove forth towards the audience speaking in many languages. This was a thrilling new vision of Babel, in which every culture, every colour, every language, every sexuality and every person was accepted and made to feel at home. More, please.